Born Rice Lake, Wisconsin, November 23, 1953; single. Graduate Bonduel High School, 1971; attended University of Wisconsin-Madison, 1971–72; B.S. in Animal Science, University of Wisconsin–River Falls, 1976. Member: Shawano Rotary; Major, Wisconsin Wing, Civil Air Patrol Legislative Squadron (official Auxiliary of the U.S. Air Force). 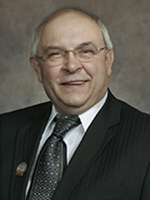 Former member: Wisconsin Farm Bureau; Badger AgVest, LLC (former director); Pro¬fessional Dairy Producers of Wisconsin (former director); Dairy Business Association; Wisconsin Livestock Identification Consortium (former director, former chair); Brown, Shawano, Outagamie, Waupaca County Republican Party; Shawano Area Chamber of Commerce; Shawano County Dairy Pro¬motions (former director); Cooperative Resources International (former vice chair); AgSource Cooperative Services (former chair); National Dairy Herd Improvement Association (former director); University of Wisconsin Center for Dairy Profitability (former chair). Elected to Assembly since 2006. Leadership positions: Minority Caucus Sergeant at Arms 2009.